In time for the hottest part of summer, Springfield Armory just announced the release of four new Range Officer 1911 models with higher-end components. Each of the new 1911 pistols will be offered in both 9mm and .45 ACP, and come with either a four or five inch barrel. 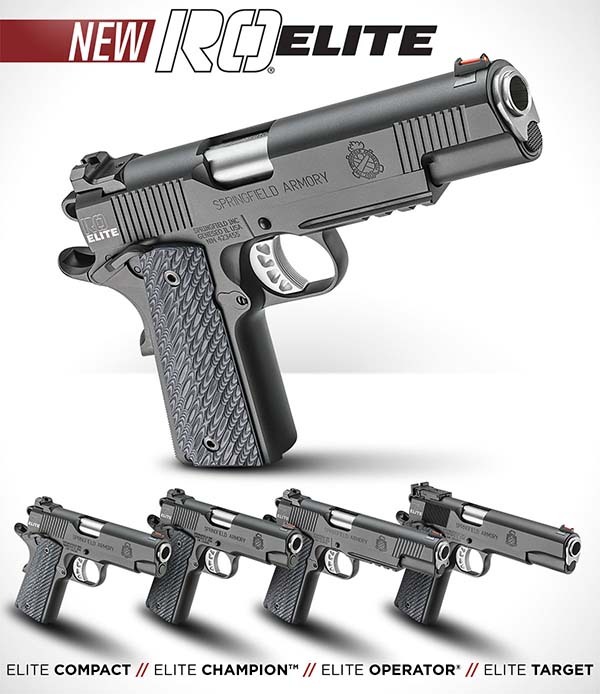 These new models are being called RO Elite, or Range Officer Elite, and are said to only increase price by $125, even though the parts upgrades are worth more than twice that amount. Each pistol also comes standard with a match grade bull barrel, an aluminum alloy or forged steel frame, and different sights depending upon which pistol suits your needs. Available in both four and five inch models, with an MSRP in the vicinity of $1050.00, Springfield Armory hopes these new 1911 models will be a homerun for the Illinois-based gun maker. While the current gun economy is a difficult one right now and it's hard to say how well these pistols will do, this is surely proof that the 100+ year old John Moses Browning design is alive and well, and doesn't seem to be going anywhere any time soon. How about you? Let us know what you think about this new pistol lineup from Springfield Armory, in the comments below. Then, when you're done with that, make sure you like our Facebook Page so you can stay up to date on news like this, whenever it breaks. Also, here is a link to Springfield's website, if you'd like more info on this pistol.